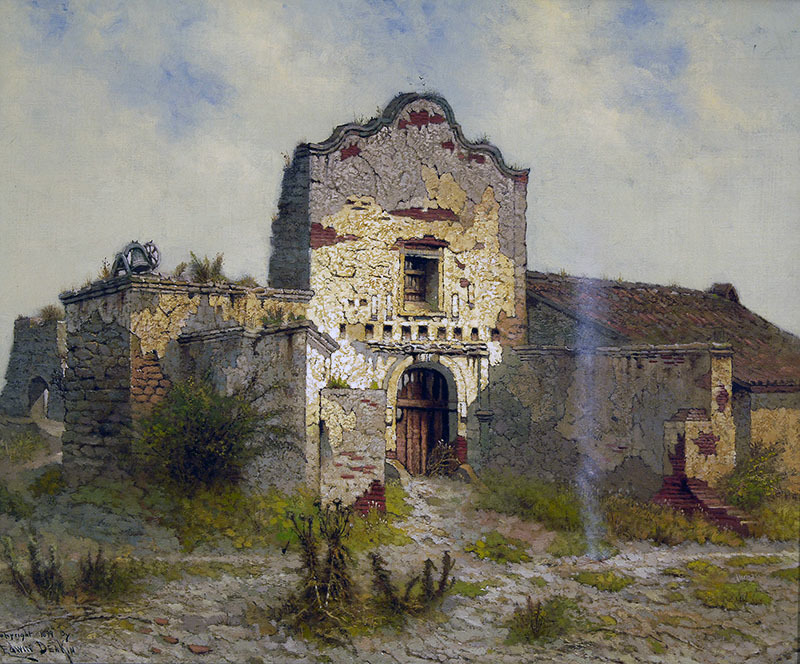 Mission San Diego de Alcalá. Courtesy of Santa Barbara Mission Archive-Library. The first of the twenty-one California missions, Mission San Diego de Alcalá is named after the 15th-century saint, Didacus of Alcalá, more commonly known as Saint Diego. Founded by Father Junipero Serra on July 16, 1769, it is here where the Spanish religious and political dream to begin an Alta California mission chain first became reality. Originally located on a hill overlooking the bay, a drought in 1774 forced the mission fathers to move Mission San Diego about six miles inland to its present location, closer to the San Diego River, to gain access to more favorable agricultural lands and the local Indian villages. The native Tipai-Ipai Indians were resistant to colonization and within weeks after the mission’s founding violence had resulted in deaths for both the Indians and missionaries. In 1775, discontented with rules and regulations, hundreds of local Tipai Indians attacked the mission, causing great damage to the building and killing Father Jayme, who would become California’s first Christian Martyr. Fearing another raid, the padres rebuilt the mission according to the specifications of an army fort. As the mission population grew, so too did the need for a larger church. The Franciscans employed master mason Miguel Blanco to construct the building, resulting in a design considered old fashion even at the time of its completion. The church features striking windows, built high for protection from intrudres, and also to prevent them from collapsing under the weight of the adobe walls. When the roof cracked in 1811, large buttresses were added to the front of the mission. This addition came just in time – the extra support allowed the mission to survive the 1812 earthquake. One of the most striking features of this mission is the 46-foot tall campanario, or bell wall, which holds five bells. The largest of these bronze bells is named Mater Dolorosa, and weighs a staggering 1,200 pounds. Common to all the missions, bells served an array of purposes: they announced the time for mass, work, meals, and siestas. Of course, they also warned of danger, tolled to honor the dead, rang to celebrate peace, and proclaimed the arrival of guests. Father Junipero Serra’s legacy remains at this southern most of the California missions. Built in 1774, La Casa de Padre Serra, is where the mission idealist once slept. It is believed that this room is the only original room to have survived Indian attacks and natural disasters. Mission San Diego’s military past has been eventful. The American military occupation of the mission began in 1846 and lasted 16 years, until President Abraham Lincoln signed a proclamation returning the mission to the Catholic Church in 1862. Today, the church and a newer chapel, La Capilla de San Bernardino, combine to serve as religious center for Mission San Diego’s still large and active parish. From north: I-5 South to I-805 South to I-52 East to I-15 South. Exit Friars Road and turn left. Turn right on Rancho Mission Road at first signal and left on San Diego Mission Road. Mission is one half block on the left. From Downtown San Diego: Proceed west on I-8. Exit at Mission Gorge Road. Turn left at signal and proceed on Mission Gorge. Turn left on Twain Avenue, which becomes Mission Road. The mission is on the right.